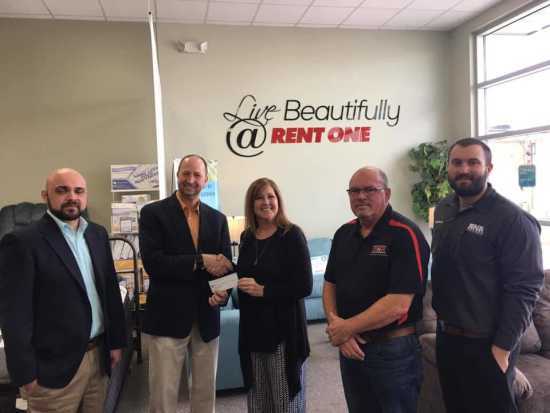 Left to Right: Terry Drum, Manager (Rent One, Cape Girardeau), Trent Agin, President (SKC Enterprises dba Rent One), Sharon Hileman, Executive Director, (CASA), Rich Bergman and Doug Martin (RNR). Voices for Children Executive Director, Sharon Hileman recently accepted a check from The Great Expectations Foundation being presented by Trent Agin, President of SKC Enterprises dba Rent One. The Great Expectations Foundation was created by Rent One's owners, Larry and Sharon Carrico, to enhance the lives of children throughout the Midwest by awarding grants to communities, organizations and groups aimed at helping children age birth to 18. The Great Expectations Foundation awards grants two times a year for programs aimed at children's education, fitness and wellness, and emotional and spiritual development. As a local and national foundation, Great Expectations makes it possible for smaller communities that may not have access to financial assistance get help for their younger residents so that they have the opportunity to develop as individuals. The funds we received from The Great Expectations Foundation will assist us in recruiting more men to serve as advocates/mentors. The majority of our volunteers are women, and while they do an excellent job advocating for the children in our program, we feel that some young boys would benefit greatly from having a positive male role model in their lives. For more information on becoming a volunteer, please contact our office at 573-335-1726.